Like all good things, it was time for the road trip vacation to come to an end. 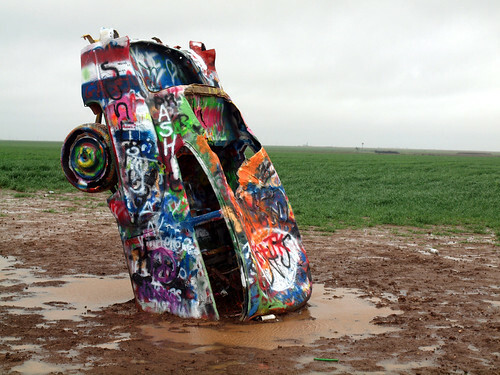 We left Tucumcari as the sky turned cloudy, and we would drive through rain as we headed towards Texas. By the time we reached Amarillo, the storm turned heavy. 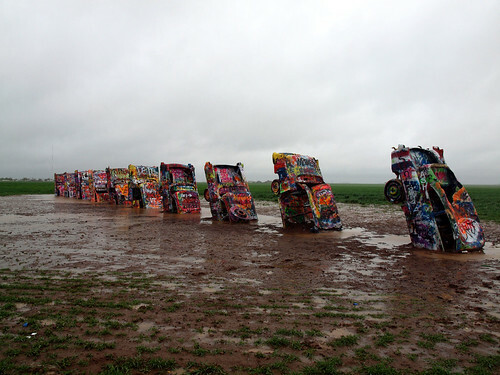 Several inches of drenching rain had fallen by the time we stopped at one of Amarillo's key attractions - the Cadillac Ranch. 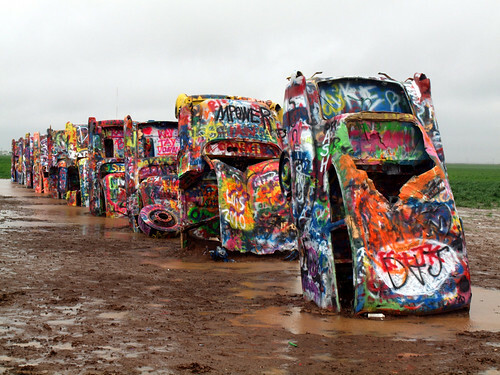 Cadillac Ranch was founded in 1974 by the eccentric millionaire Stanley Marsh 3. 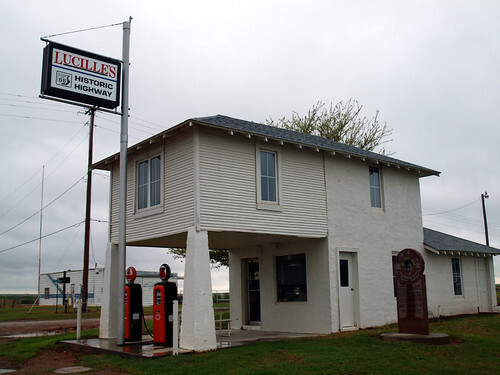 Although it is located along part of I-40, it has become a Route 66 stopping point. It features a collection of old Cadillacs, stuck into the earth at the same angle of the Great Pyramid in Egypt. The ranch is located in a field alongside an I-40 access road. To reach the old cars, you cross under a small gate and walk along a dirt path that cuts through a field. With the heavy rain that day, the dirt path was a muddy mess. I wasn't sure if it was worth trudging through the muck, but I headed on anyways. It was easier to walk through the field, since the mud wasn't as deep. I still ended up getting a thick coat of mud on my shoes and pants. 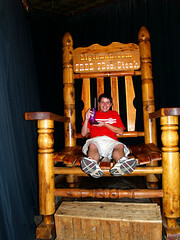 From there we travelled to the famous Big Texan Steak Ranch. 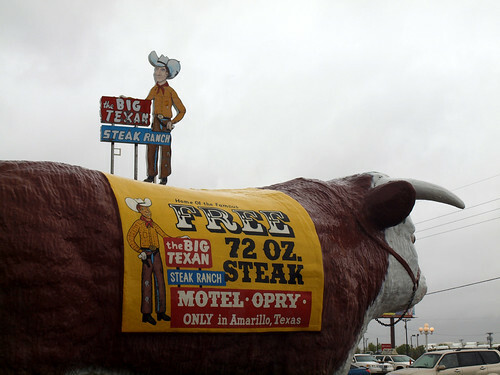 This is the big restaurant in Amarillo that offers a massive 72 oz. steak which is free if you are able to eat it, along with a baked potato, salad, rolls, and some shrimp all under an hour. If you can't finish, your bill is only $72. We drove there in the rain, and hurried in. I did order a steak, but only got a wussy-sized 8 oz. 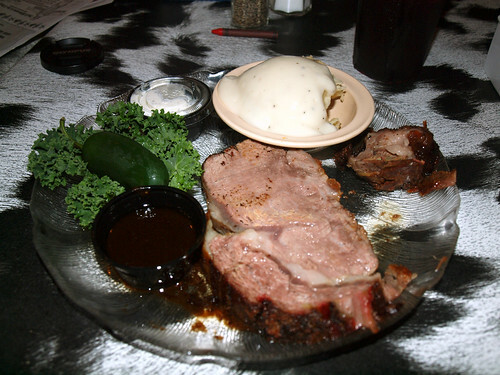 Prime Rib. 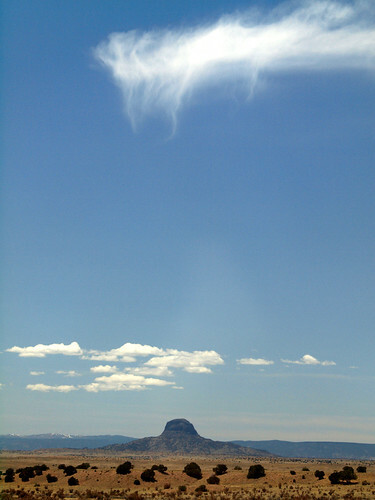 For a comparison, this was taken during a previous visit during a Road Trip in 2007. We headed west into Oklahoma, with hopes of visiting the Route 66 Museum in Elk City, but it was already closed for the day. Instead we continued on and paid a visit to Lucille's, a former fixture along Route 66. The station was ran by Lucille, who greeted travelers for decades. Sadly, when she passed away, the old station closed down as well. 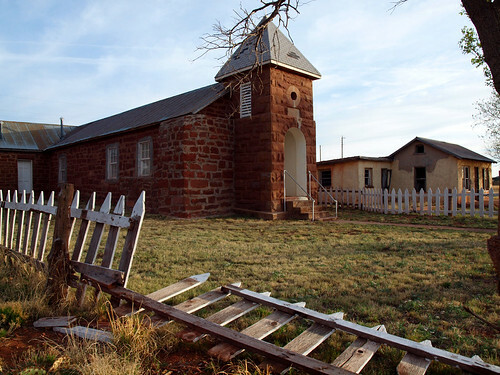 The station still sits, watching the traffic of I-40 and the occasional travelers along Route 66 drive past. From Cuervo we headed east towards the city of Tucumcari, New Mexico. 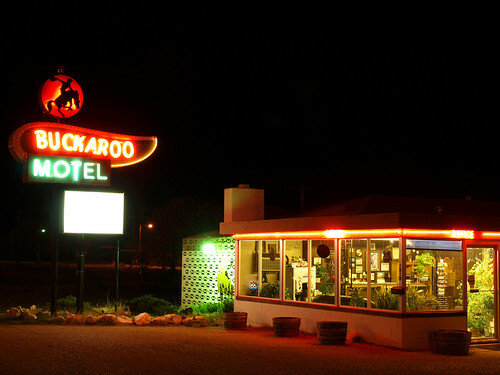 Tucumcari is the largest city along the freeway between Albuquerque and Amarillo, so it has long been a popular spot to stop and spend the night. 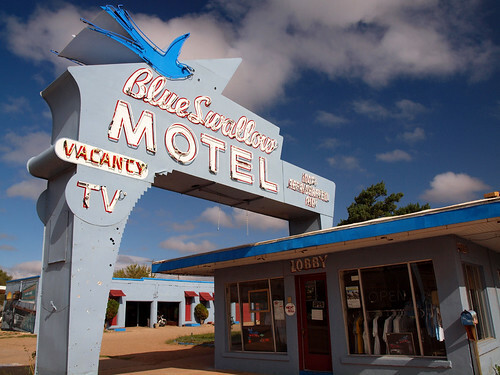 Back in the days of Route 66, signs along the road would brag on the city's numerous hotels and motels, asking travelers to stop in "Tucumcari Tonight!" That slogan is still being used, and is plastered on numerous billboards along I-40. Now Tucumcari is one of the iconic old stops along Route 66. 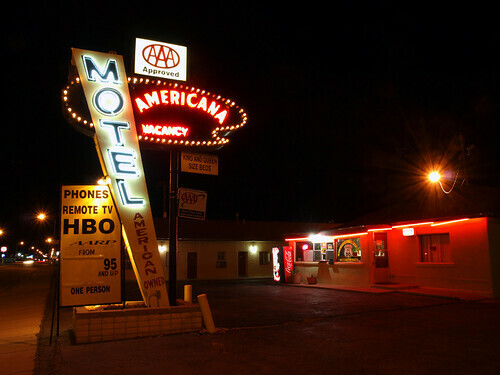 The city has a fine collection of old vintage motels, complete with neon signs that promote such 1960s luxuries as air conditioning and color tvs. To drive down Route 66, past the rows of old motels, offers a fleeting glimpse of what it was like to make that same drive back in the town's glory days. 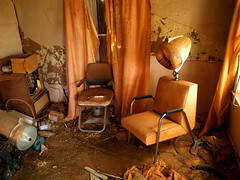 Of course, not all the old motels have survived. 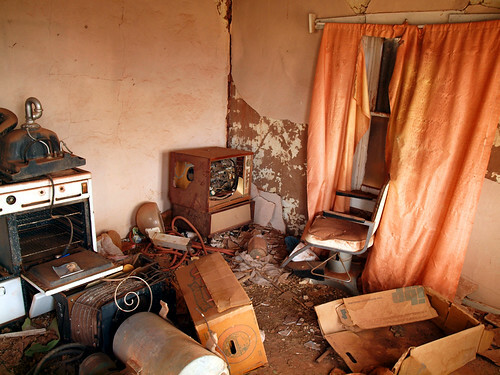 There are many old buildings that have been abandoned over the years. 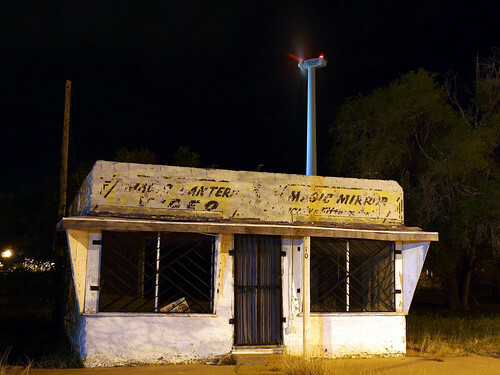 This old gas station sits in Tucumcari, just below a giant modern wind mill. 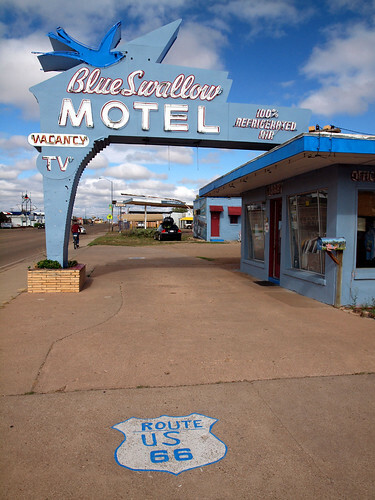 One of the most famous buildings in Tucumcari, and arguably along Route 66, is the old Blue Swallow Motel. Since it opened in 1939, it's been a fixture along the old road. It's still open, with a distinctive neon sign inviting customers in. 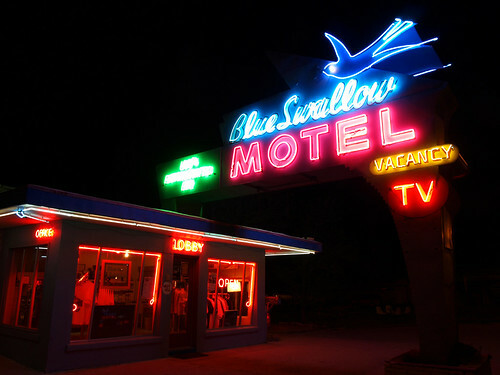 We spent the night in Tucumcari, but regrettably not at the Blue Swallow Motel. The next morning we headed back out to visit some of the sights in the daylight. There are a large number of vintage old places here, with distinctive architecture. 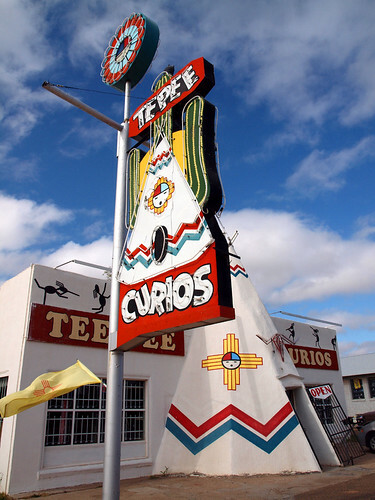 You can stop at a souvenir shop with an entrance shaped like a tee pee. You can eat at a Mexican restaurant with an entrance shaped like a sombrero. 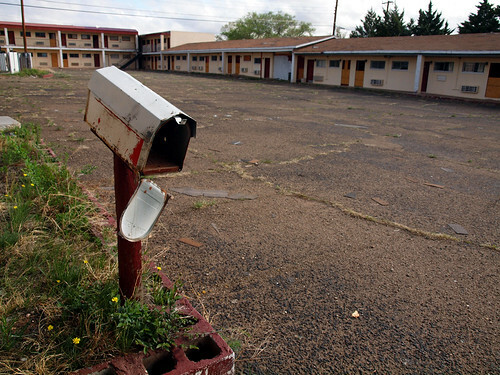 There isn't any other place quite like Tucumcari. From Albuquerque, we headed east and stopped for a quick visit in Santa Rosa, New Mexico. Santa Rosa is a small town, and is home to part of old Route 66. 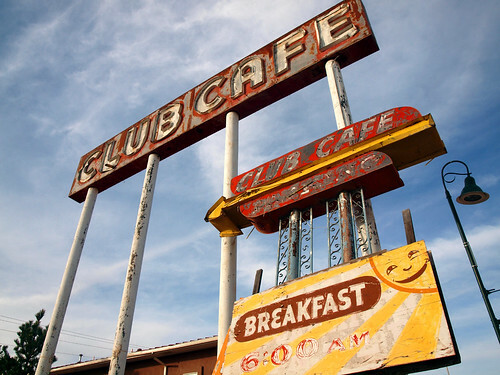 A longtime fixture along Route 66 in Santa Rosa was the Club Cafe, which sadly isn't in operation anymore. The only remnant of the place now are these old signs. We drove along the path of Route 66 and stopped at a few of the old haunts. 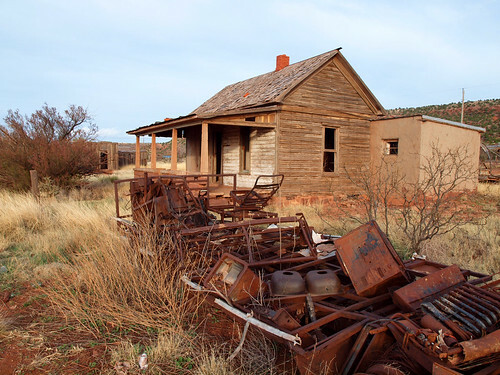 And then we got back onto the freeway and headed east towards the ghost town of Cuervo, New Mexico. 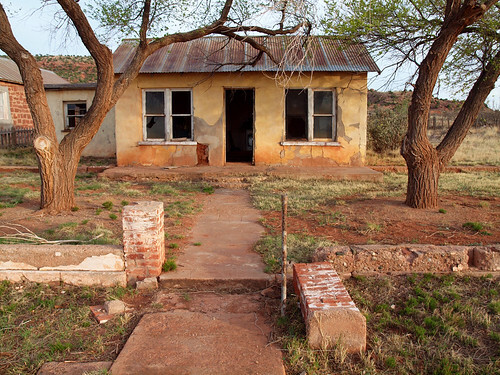 Now there are numerous ghost towns along Route 66, but Cuervo might be the largest and most complete ghost town. This old home sits on the edge of the town, complete with a rusting skeleton of what might be an old bus. Cuervo is a sad and lonely place. But its history dates back to the early 1900s, when the Southern Pacific Railroad passed through. 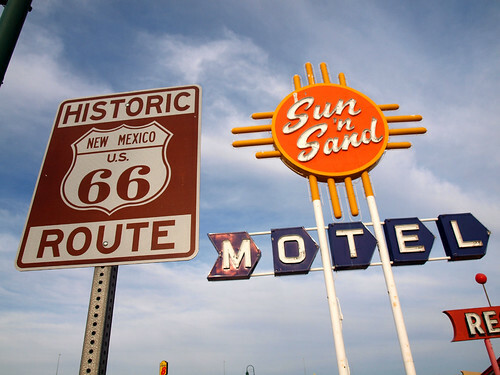 When Route 66 was established, a few gas stations and hotels opened up. During it's peak, Cuervo had two schools, two churches, and two hotels. By the 1930's, the town had a population of about 300 people. But that number would soon dwindle, and by the 1940's only 150 people still lived there. When Interstate 40 was constructed, it cut through the middle of Cuervo's residential neighborhoods and essentially divided the town in half. 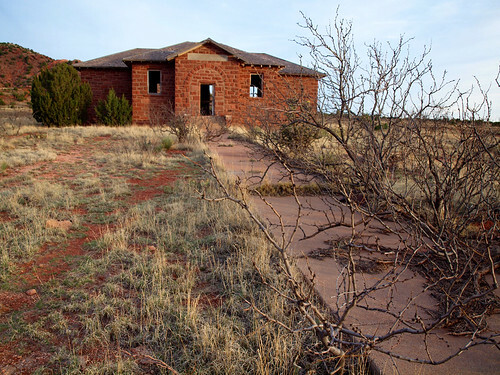 After the interstate was built, the town withered and turned into the ghost town that greets travelers today. This old house sits on the south side of the freeway, and has been abandoned for many years. The front door of the old house is permanently open, so I invited myself in to have a look. 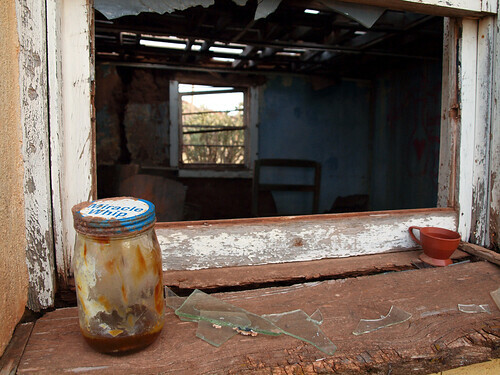 Cuervo isn't entirely abandoned, since it seems like people still live out there. I heard random yells and voices coming in from the distance, which added to the creepy state of the town. That abandoned house sits next to this old church, which still seems to be in good condition. Both times I've visited this town, I had the strange sensation that I was being watched. 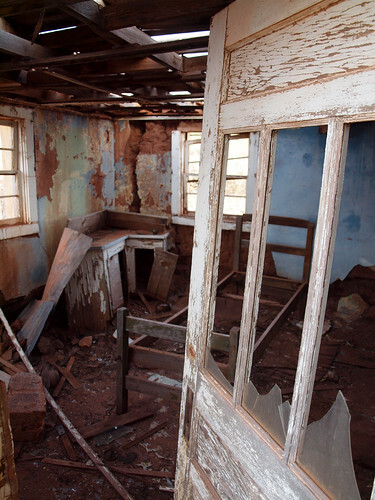 That did easily add to the creepiness of this lonely old ghost town. 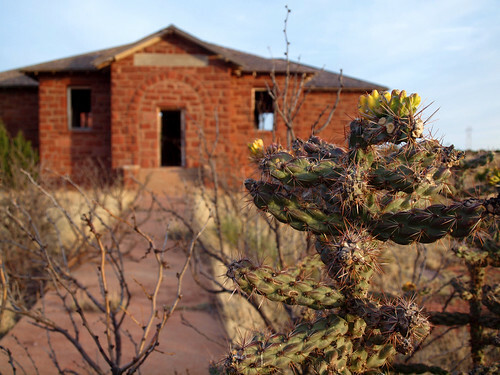 On the west side of town is this old school, situated in an almost poetic field of straggly cactus plants. 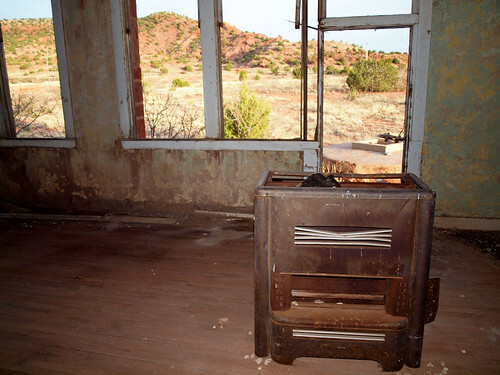 The interior of the school is empty, except for a few old stoves. These might have been used to heat the school back in the days when students actually attended classes here. 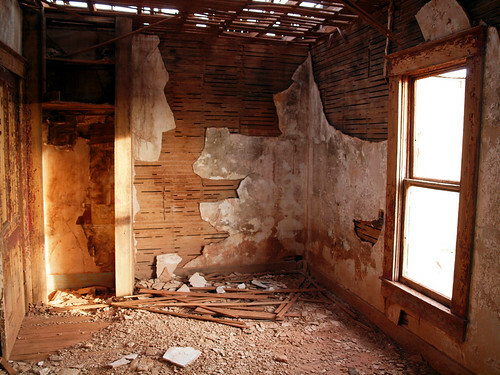 Now the windows are gone, and the building is open to dry winds of the desert. 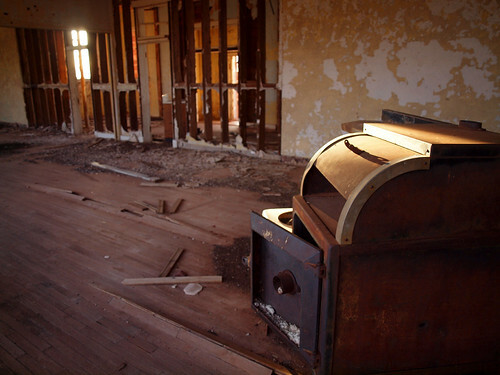 The light from the setting sun passed through the open windows and hit the side of this old stove, sitting in the old and empty school room. Sadly our stay in Colorado had come to an end, and it was time to make the drive back home. But we had at least decided to take our time on the way back so we wouldn't have to rush during the long drive across five states. After hauling everything down the three flights of stairs at the hotel, the car was packed and we bid farewell to Durango. 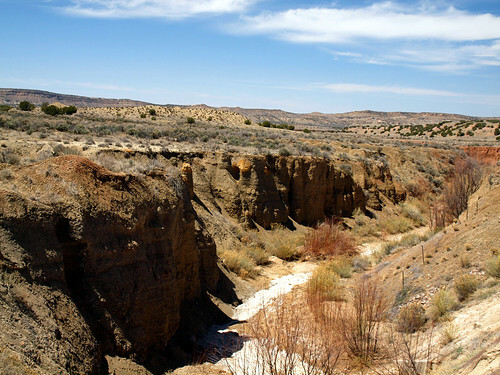 Driving south into New Mexico, the landscape changes to a arid desert with tall mesas. It has a stark beauty, especially since it's so different than the landscape that I normally see. We made it into Albuquerque in time for a late lunch, and drove into the Old Town to find something to eat. Albuquerque is a neat city, and pretty historic too. It was founded in 1706 as a Spanish outpost along the Rio Grande. 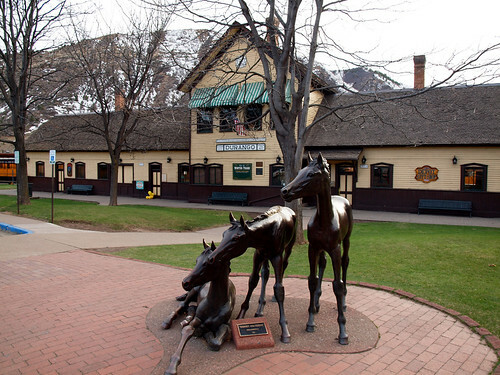 The historic heart of the city is "Old Town Albuquerque," which is centered around a large plaza that dates back to the days of the city's founding. We went to get lunch at a Mexican restaurant across the street from the plaza. 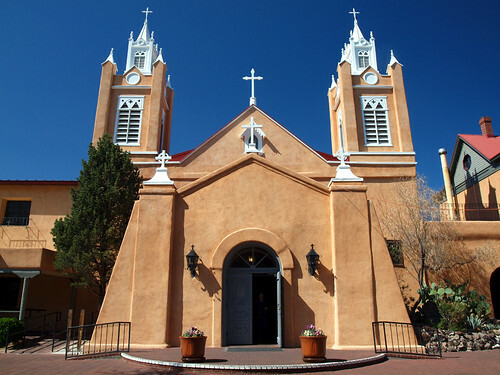 The plaza is overlooked by the imposing San Felipe de Neri Church, which was built in 1796 and is the oldest building in Albuquerque. The weather could not have been any different than the day before, when we drove up to Silverton in the snow. Instead it was a bright and sunny morning as we walked the few blocks to the train station in Durango. 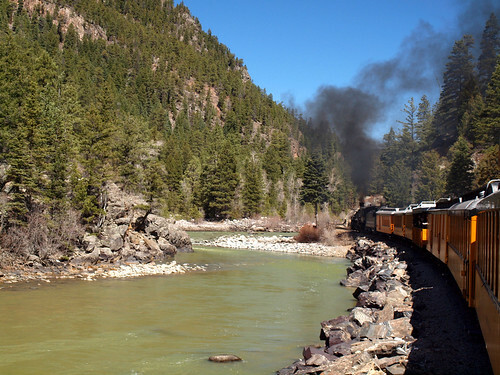 We had tickets to ride the popular Durango and Silverton Narrow Gauge Railroad, which heads high up into the San Juan Mountains alongside the Animas River. It was a neat experience, although a bit pricey. I purchased the cheapest possible seat on the train, which still cost $49. And that was even a cheaper price than usual because the train didn't actually run all the way to Silverton. It went about halfway because the tracks around Silverton were still coated with snow. 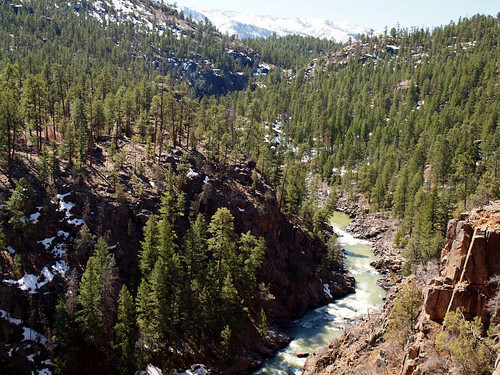 But the train heads into a part of the wilderness that you can't see otherwise, and provides some breathtaking views of the river and mountains. 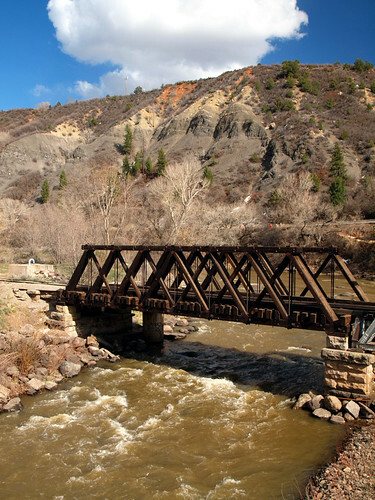 The route the train takes was laid out in 1882 and 1883, as part of a rail line that connected Durango to the mines in Silverton. Trains have traveled this route in some way or another continuously since 1882. There weren't too many tourists on the train that day, so they let us get up and sit in either the coaches or one of the open-air gondolas. The gondolas were better for getting pictures, so I quickly headed out there. The locomotives here are authentic steam engines, which means that there is smoke that will sometimes drift back to the open-air cars. Along with the smoke are tiny bits of embers that will quickly try to get in your eyes. I was too cheap to buy the $3 protective glasses they sale on the train, even if they did look kinda like Bono shades. 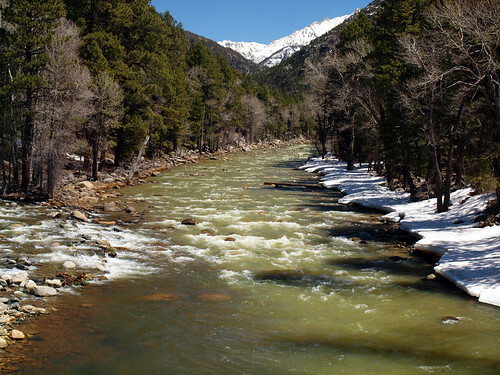 The tracks eventually dropped down from the mountain and closely followed the course of the Animas River. 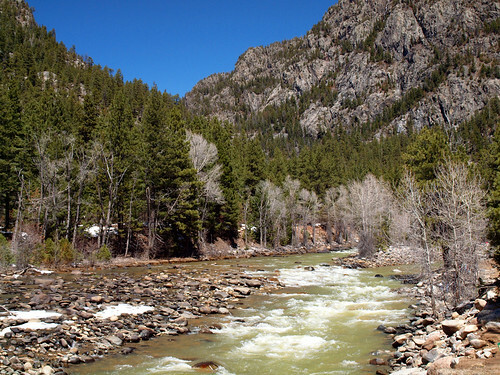 It's a very scenic river, flowing past huge boulders and under massive mountains. As it climbs back up into the mountains, the train passes by two narrow cuts in the rock, which nearly resemble tunnels. 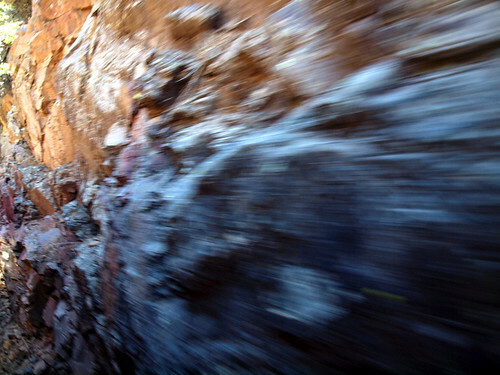 The rocks form a narrow chute for the train, and it seems like there is just barely enough space to squeeze through. Even though the conductor had asked people to not lean or reach out, many people still tried to touch the rocks as we went by. 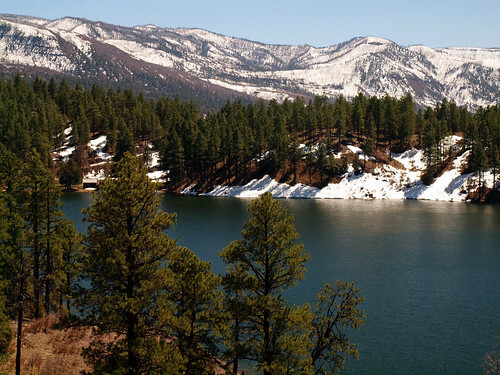 As it descended towards Durango, the train passes by this large mountain lake. I think (although I'm probably wrong) that this is Shalona Lake. As you get closer to Durango, the train passes by fields surrounded by the mountains. There were plenty of horses out in the fields, and also an amusing number of prairie dogs that would pop out of the ground and watch the train go by. 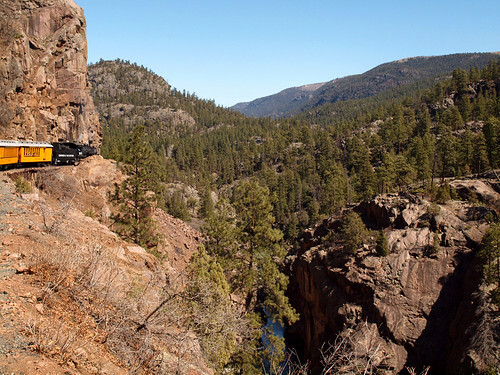 The Durango and Silverton Narrow Gauge Railroad isn't a bullet train for sure - it's pretty slow going. The fastest the train goes is around 15 miles an hour. I wondered if they could use the same fuel that the train used in the finale of Back to the Future 3? The train finally dropped into Durango, slowly cruising through the city. As we went through a city park along the river, four teenager dropped their pants and mooned the train (sorry, no pictures). The conductor walked by a few minutes later and jokingly asked if we "had enjoyed our travel through Moon Valley." 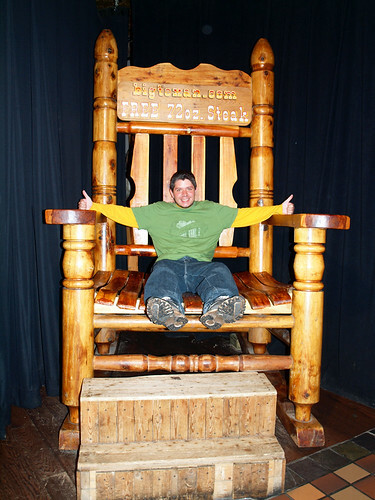 Here are a few photos taken during our stay in Durango, Colorado. 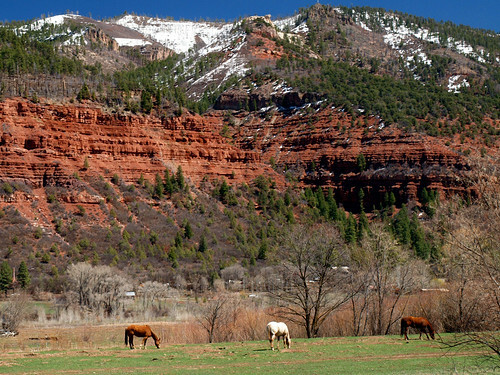 Durango is an awesome place, situated along the Animas River Valley and surrounded by mountains. Our hotel was perfectly located in downtown, which is compact and easily walkable. The hotel actually overlooked the rail yards for the Durango and Silverton Narrow Gauge Railroad, which was cool too. Aside from the elevation, I really loved Durango. I've been tempted to start looking to see what job openings they have out there, even if it would mean trading in my Pontiac for a Subaru. 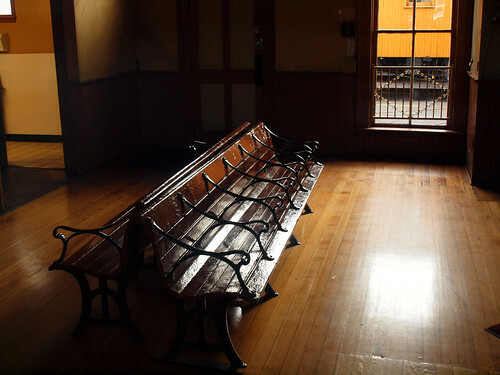 And this is the view looking in one of the windows - with an old bench sitting in the lobby. 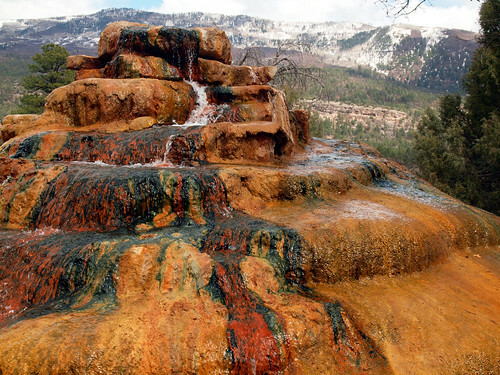 North of Durango, along the road to Silverton, are the Pinkerton Hot Springs. They sit just off of the pavement, and at first look like some bizarre fountain. 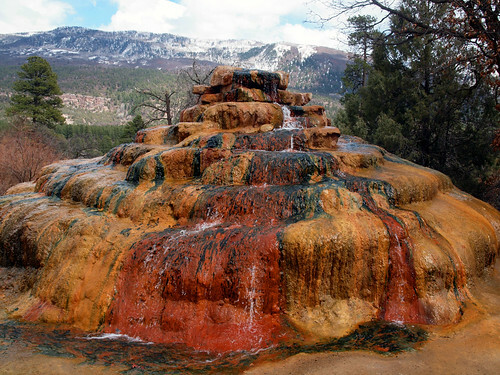 But it's a natural hot spring, with a steady stream flowing out from the top. It is truly a strange sight to see, like someone lifted part of Hot Springs National Park or Yellowstone and dropped it right down next to the road. It doesn't seem like I'm the only person who has become infatuated with Durango. 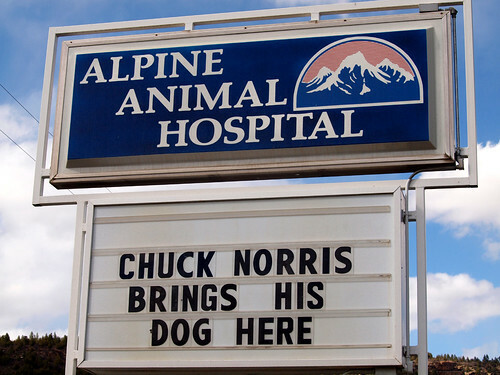 After driving by this vet's office sign, everyone in the car cracked up laughing and we had to turn around and get a shot. I guess Walker decided to pull up stakes and leave Texas? 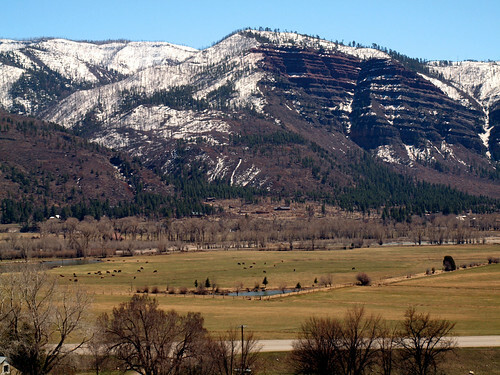 Durango was founded in 1880, and has a population of around 15,500 people. The town was founded by the Denver and Rio Grande Railroad who originally wanted to place a depot in the nearby town of Animas City. But when that town wanted a dowry from the railroad, they just decided to go and create their own town instead. So in 1880, Durango was founded. The railroad designed the lay-out of the city, which still reflects in the compact downtown that you still see today. 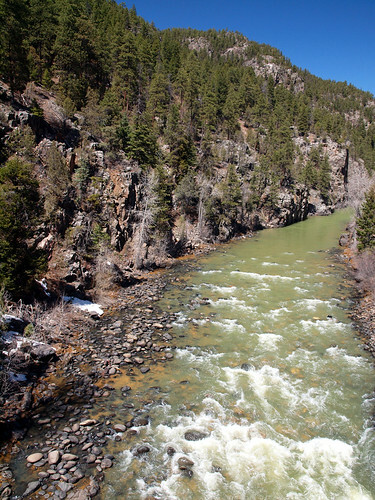 The Animas River cuts through Durango, and there are miles of trails along the river. There are also numerous pedestrian bridges, which provide some cool views of the river. 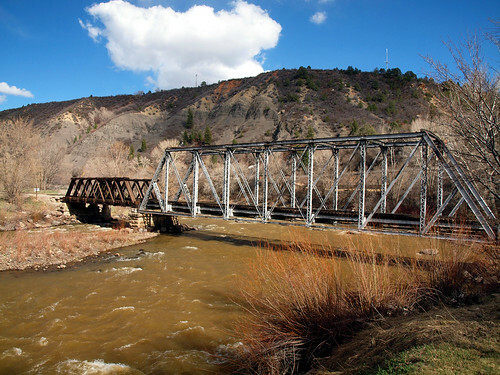 One bridge sits right next to an old rail bridge, which still sees use by the Durango and Silverton Narrow Gauge Railroad. We rode over that bridge the next day, when we took the train ride. 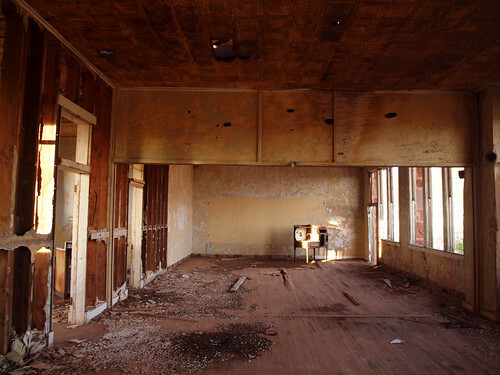 And one quick shot of the old Strater Hotel, in downtown. 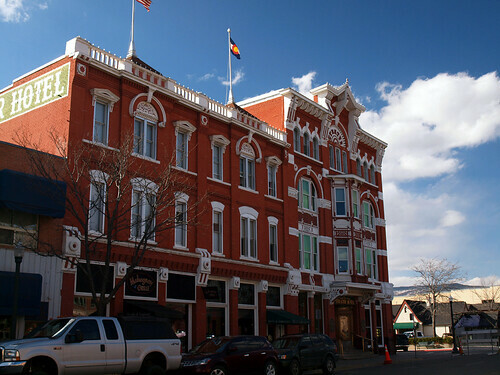 The hotel was built in 1887. It's a bit fancier than the place we stayed (and I bet the elevators worked there, too).